Ontdek de geheime kant van Rome terwijl je het toeristisch parcours afwandelt tijdens deze 3,5-uur durende tour. 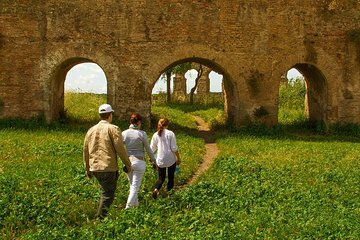 Wandel door de straten van de historische Joodse getto, gluur naar binnen in het gigantische Circus Maximus en volg een deel van de oude Romeinse Via Appia. Onderzoek vervolgens onbekende historische locaties zoals het park van de aquaducten en de thermen van Caracalla; Kijk uit over de stad vanaf Janiculum Hill en geniet van een uniek uitzicht op de koepel van St. Peter. Deze tour met kleine groepen is beperkt tot 15 en zorgt voor een persoonlijke ervaring. Andy, our Australian guide on the tour was fantastic..very knowledgeable and managed to keep us entertained throughout the tour. It was great to take a step back from the more popular attractions and see more of Rome. We found the tour to be interesting and educational. Walked around the small Jewish ghetto- our guide was somewhat knowledgeable. He was much more knowledgeable about the aqueducts. Marta was tremendous, was great to see the history of both the Jewish Ghetto and the Aqueducts in person to be in awe. A fun time at the end of the trip with the canon on the hilltop. Transportation was easy, group was smaller and the entire time felt like a friend showing us around. Would highly recommend! Our tour guide was very knowledgeable (degree in archaeology) and treated us to many stops outside of just the Appian Way Aqueducts and Jewish Ghetto (I won't ruin the surprises!) Would recommend to anyone! Melanie was a wonderful guide for a truly interesting and historic part of this trip. I almost did this on my own, but am glad I used the bus and guide to allow for more explanation. 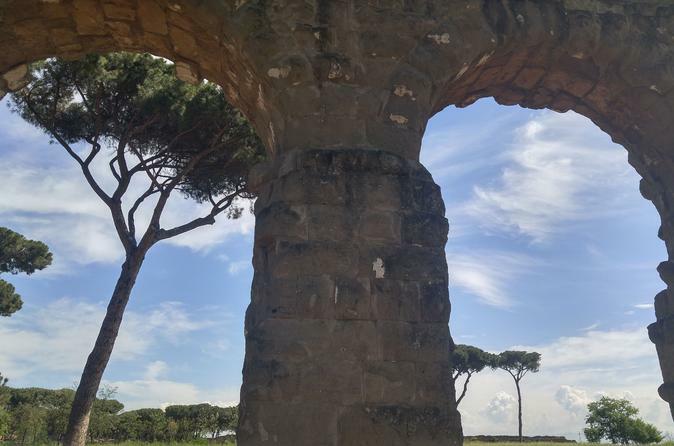 Both the Appian Way and Aqueducts are amazing architectural accomplishments, and I would have not appreciated them as much without her explanations. Loved this tour! Small group, no crowding or waiting in lines. Able to see sites besides the run of the mill tours usually offered. Our guide was very informative as well as giving us lots of small interesting facts about each site. It was a very hot day and he was very conscientious about making sure his stops for discussion were located in shade and well timed. Would recommend this to anyone! Wonderful tour, not to be missed! Really wonderful tour, don't miss this one. This tour was great! It was our last day in Rome and we wanted to do something that other tours don't offer. Super cool sites were visited and our guide was amazing! Thanks to our excellent guide!